"CBT architects of Boston will design the buildings, the tallest of which - closest to the river - is tentatively slated to be 10 floors. Others will range from four to six stories." "The Framework addresses height and massing of new buildings to ensure in general the preservation of the traditional character of residential neighborhoods while allowing the kind of significant new development that will bring substantial benefits to North Allston. Thus, west of North Harvard Street the Framework envisions heights of up to 35' on the southern side of Western Avenue and a mix ofheights on the north side, with further community review of buildings with heights over 45-55' (with an assumed maximum height of 95') and an expectation that these taller buildings would offer substantial public benefits such as additional affordable housing and public space." So on both sides of the Western Ave it sounds like Charlesview, Harvard, and the BRA have decided that the "envisioned" and "assumed maximum" heights can be exceeded. The NASFP goal to "acknowledge the need for careful transitions in scale, vehicular circulation, and design between existing residential neighborhoods and new development" also seems in jeopardy. The project seems to have been fully designed without any input from people who live on Litchfield, Holton, and other nearby streets and would be greatly affected by it. "Harry Mattison raised the topic of special study areas that were mentioned in the NANSP but never done and asked whether the Task Force wanted to pursue the study areas, particularly the Holton St. study. Gerald suggested that he was open to the Task Force’s ideas about what to incorporate into the Holton St. study that would be useful to the Task Force. Ray suggested that until there was something to react to, it didn’t seem fruitful to pursue completing the studies." Well, now there is certainly something to react to! Sen. Steve Tolman is teaming up with Reps. Kevin Honan and Michael Moran and the Commonwealth Health Insurance Connector Authority to provide information about the state’s new health care reform law and enroll local residents. The “Connect to Health” enrollment event will be held Wednesday, Dec. 5, from 4-7:30 p.m. at the Kells, 161 Brighton Ave,. Allston. The Joseph M. Smith Community Health Center, Caritas St. Elizabeth’s Medical Center and the Boston Public Health Commission’s Mayor’s Health Line will also be co-sponsors, and they will send local enrollment experts to participate in the event. Adults who do not have health insurance this year will lose their personal exemption worth $219 when they file their next state tax return. Penalties will be significantly higher beginning Jan. 1. Detailed information on the new health plans is also available on the Health Connector’s website, www.MAhealthconnector.org, or by calling 1-877-MA-ENROLL. The Harvard Crimson :: News :: University Acquires Allston Land: "Community Builders will submit a proposal to the Boston Redevelopment Authority by the end of the year." From www.tcbinc.org - The Community Builders, Inc. works in collaboration with neighborhood groups, residents, public and private agencies, and philanthropic interests. Becoming a long-term stakeholder in the neighborhood, we create effective local implementation teams that combine neighborhood understanding, technical skills, and managerial ability. OK - Let's see that neighborhood understanding and collaboration with the public! Allston and Brighton are ready! Charlesview Inc., the non-profit owner of Charlesview Apartments in Allston, and Harvard University have signed a purchase and sale agreement for the Charlesview property at the intersection of North Harvard Street and Western Avenue. When this transaction is completed, it will enable Charlesview Inc. to construct a new apartment complex for its residents on property currently owned by Harvard located a half-mile from the current complex and allow Harvard to use the existing Charlesview site as part of the new campus. The signing of the purchase and sale is an important step in the overall process required to finalize this transaction. While there are additional steps to follow, such as Charlesview filing their development proposal for the new apartment complex with the Boston Redevelopment Authority (BRA), this is another important step for Charlesview, Harvard and the City of Boston. Finalization of the agreement would enable Charlesview Inc. to build a new apartment complex that would maintain the existing 213 affordable units on one site and accommodate a new mixed-income program for working families in Allston -Brighton. We are pleased that this land exchange agreement would enable the Charlesview Apartments to remain an essential affordable housing resource for the Allston-Brighton community for generations to come. The new Charlesview site incorporates a portion of the Brighton Mills Shopping Center, as well as a parcel on the north side of Western Avenue, with frontage on Soldiers Field Road and the Charles River adjacent to the Telford Street pedestrian bridge. The current Charlesview land at North Harvard Street and Western Avenue (known as Barry’s Corner) would become part of Harvard’s future campus in Allston. As you know, Harvard is currently considering possible academic uses of this site as part of its master planning process. This Globe Op-ed was published 8 months ago, but the questions it raises are very relevant today as we discuss the potential roles that Harvard might have in Allston as it expands its campus. Robert Forrant, a professor at UMass-Lowell, writes in Beyond campus borders that, "engaged colleges and universities can play a catalytic and sustained role in social and economic development beyond simply the theoretical when their on- and off-campus efforts are guided by a reflective institutionwide and communitywide discourse." "Tensions mounted at the most recent Harvard-Allston Task Force meeting this week, with residents demanding to be heard as the deadline for the school and city to reach a community benefits agreement looms." Some attendees, including task force member Brent Whelan, argued meeting chairman Ray Mellone restricted discussion of community benefits too much and kept it off the meeting's agenda. "This agenda is [wrongfully] a closed item that belongs to you, and you alone," Whelan said to Mellone during the meeting at the Honan-Allston Branch Library. After receiving applause from the packed meeting room, Whelan passed out a list of benefits he said should be discussed, prompting several people to call for a greater community voice in planning. Rep. Michael Moran (D-Boston) said the problem is "a trust issue" between the Allston-Brighton community and Harvard. "Members of the Allston neighborhood last night offered up a cacophony of shouts insisting that their voices be heard in the debate over what benefits Harvard should provide to the community as it plans its expansion across the Charles River. At a meeting of the Harvard Allston Task Force last night, Allston residents said they were no longer content with waiting as the deadline for the legally binding plan for community benefits to be implemented by Harvard over the next decade reaches its year-end deadline. “Lots of people in the community have thought about the benefits questions but have not had the chance to voice those concerns in this forum,” said task force member Brent Whelan. “I’m wondering when in this meeting will the 50 or so neighbors present...have time to represent their opinions?”"
"Getting neighbor’s voices heard. On first glance, the formation of yet another organized group of neighbors who are frustrated by institutional expansion in Allston and Brighton seems excessive. So many have popped up over the past year. The Allston-Brighton North Neighbors Forum, however, seems different. At a recent Harvard-Allston meeting neighbors expressed frustration at not being able to talk during meetings, and were advised by Gerald Autler of the Boston Redevelopment Authority to take their concerns to task force members who would, in turn, bring them to Harvard and the city. The ABNNF is a logical response to that. As task force member Brent Whalen put it, the group is a great forum for neighbors to talk, organize their concerns and ideas and then pass them on to the task force. It’s unclear if the group will get the community benefits it’s asking for from Harvard but the group is a good mechanism for neighbors to get their voices heard." The next ABNNF meeting is Tuesday from 6-8 at the Gardner School. Please join us. H2O Applied Technologies is a local company that helps companies reduce waste and increase efficiency in their use of water, electricity, and other resources. "At St. Elizabeth's Medical Center in Brighton, one of the first to use H2O's save now, pay later model, officials estimate they've cut total energy and utility costs by at least $500,000 a year." St. E's is one of 6 Massachusetts hospitals and one of 49 in the country to receive the 2007 Premier CareScience Select Practice National Quality Awards. Today's Globe and last weeks' edition of the WBUR program "Radio Boston" both look at the increased activity of the movie industry here in Allston and Brighton. Radio Boston explains that the recent boom in movies being filmed in Boston is the direct effect of a new state tax credit for the movie industry. Much of the show was taped at Brighton Mills in the former Frugal Fannies space that is owned by Harvard and has been used for at least two movies in the past few months. The Globe story looks at some of the movie related businesses located along the Mass Pike on Braintree Street in Allston, including the creators of Boston.TV which describes itself as "Boston’s premiere online video entertainment network seeking to both inform and entertain through unique and compelling video content". For some reason, there are people who throw the "obstructionist" label at people in Allston and Brighton who ask reasonable questions and have reasonable concerns about development in our neighborhood. Here is a real example of neighbors trying to stop development. "Boston Properties wants to build an ugly 30-story apartment building at the Prudential Center that will block the views and cast shadows over their ugly 18-story Trinity Place. The urban millionaires are beside themselves. "To approve their project as is would be nothing short of criminal to those of us who live in this neighborhood," William F. Thompson, a founder of Boston Ventures, fumed in a letter to the Boston Redevelopment Authority. And on and on. The Trinity millionaires have launched a letter-writing campaign in hopes of blocking Boston Properties' proposed 200-unit apartment building on Exeter Street over the Prudential garage and just beside the Lenox Hotel. They worry about traffic. They worry about shadows and wind. They worry about their property values. They worry about the character of their neighborhood. Tom Menino never met a big building he didn't like. The mayor's reasoning is straightforward enough: Big buildings pay more taxes than small buildings. Menino has spent years systematically killing the character that makes Boston so special by planting big, ugly buildings everywhere." I had never heard of the group Transparency International before reading this letter in today's Globe. Considering the super-secret back-room dealing that has lead to the BRA-Harvard agreement on community benefits for Harvard's Science Complex, it is worth considering this definition. "Transparency" can be defined as a principle that allows those affected by administrative decisions, business transactions or charitable work to know not only the basic facts and figures but also the mechanisms and processes. It is the duty of civil servants, managers and trustees to act visibly, predictably and understandably. Not only are the basic facts and figures of the Harvard-BRA agreement far from clear, the mechanisms and processes that led to the agreement are even more of a mystery. University Park Campus School - Founded in 1997, UPCS is one of the top-ranked urban high schools in the country with 231 students in grades 7-12. " UPCS Students and teachers are on Clark’s campus nearly every day, not only using the labs or the gym but also observing and interacting with Clark students and faculty. UPCS students take mini-seminars with college faculty in grades 7 to 10, and most enroll in college classes for credit during their junior and senior years." Home-buying incentives for faculty and staff - Faculty and staff who buy a home in the Main South neighborhood of Worcester receive a $5,000 interest-free loan, which is reduced by $1,000 each year they live there. They also receive a 12 percent salary bonus annually for the first seven years they live there, with a $4,000 yearly maximum. 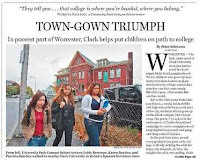 Even people at Harvard recognize the value of what Clark is doing - "It's an extraordinary success story," said Paul Reville, a Harvard University education policy researcher who is chairman of the Massachusetts Board of Education. "These are students who have not traditionally done well in the public school system, and here they are all going on to college. There's a steady stream of people wanting to see how the school has done what it's done." At last week's Harvard Allston Task Force meeting, the Harvard employees kept very quiet during Michael Contompasis's discussion about a deep partnership with Harvard and the formation of a university-assisted community school. Maybe a trip to Worcester would help. 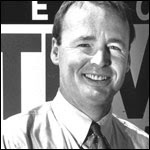 Bob La Trémouille, writing on the "Charles River White Geese Blog", remarks on Harvard's A/B landbanking and similar practices by MIT in past decades. Charles River White Geese Blog: Developer type claims to have lost 30 acres of wasteland which existed for up to 30 years in Cambridgeport. ABNNF meets Tuesday from 6-8 - Help us improve our community's future! The Allston/Brighton North Neighbors Forum is meeting on Tuesday from 6:00-8:00 at the Gardner School (30 Athol St). The community benefits that accompany Harvard's Science Complex can make a major positive impact on our neighborhood. Or the benefits might have little lasting effect and set a poor precedent for the decades of construction that Harvard will be doing here. To get the result that we deserve, the community's voice must be loud, clear, and taken seriously. So far, all we have is a proposal from Harvard that many people consider vague and inadequate. Please join us as we organize and join together to put the "community" in "community benefits". You can join our email group and see what people are talking about at http://groups.google.com/group/ABNNF. Tuesday, November 27 in room 900, City Hall. For more info call 617-635-3850. What can Harvard learn from the University of Cincinnati? The Globe's architecture critic Robert Campbell takes a look at changes in Cincinnati that have resulted from a rapid building program by the University of Cincinnati. 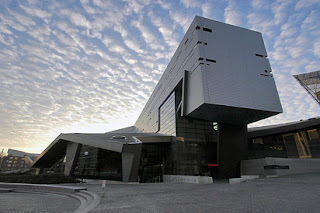 The UC Photo Gallery and virtual tour give a glimpse at some of what has been built recently. For more information, there is a extensive collection of articles about the UC master plan at the University of Cincinnati magazine website. Since 1991, Hargreaves Associates has been developing the UC Master Plan. Coincidentally, Hargreaves has an office on Magazine Street Cambridge, just across the River St bridge from Allston. "Harvard in Allston should possess some of the charge of urban energy you get at Cincinnati, the kind of feeling I've always associated with big-city schools like New York University. But it doesn't have to look like a world's fair of self-expression by individual architects." www.towngownworld.com is a new website with a lot of information relevant to the our situations here in Allston and Brighton. There is link to a review of a book by Rockefeller Foundation president and former University of Pennsylvania president Judith Rodin titled "The University & Urban Revival" and a link to an article by Rodin "Working With the Neighbors". Another link is to "When the Gown Devours the Town" that discusses a recent panel discussion in New York on the subject of "When the Big Get Bigger: New York’s Universities and Their Neighborhoods". Judith Rodin was a speaker at this forum and this excerpt gives a glimpse into what happened at Penn during her tenure. In Penn’s case, the university ultimately spent or obtained hundreds of millions of dollars for programs to improve public safety, support retailers and other small businesses, build housing and improve public schools. Hopefully www.towngownworld.com will continue to post new information and resources and be a great source of learning for us. Will the next dean of Harvard's School of Public Health connect with Allston? Today's news includes the upcoming vacancy at the top of the Harvard School of Public Health. Barry Bloom, dean for the last 9 years, is stepping down from the deanship at the end of this academic year. People in Allston and Brighton have voiced many ideas about how Harvard's School of Public Health could be involved in our community in ways consistent with the school's mission. Certainly there must be numerous ways - including research, health education for adults and children, and access to quality medical care - that the school might consider as opportunities to improve the health of the people who will live in the shadows of its new campus. So it unfortunate that Dean Bloom's vision for the School of Public Health in Allston makes not even a mention of the people who live in Allston and how the School might be relevant to their lives. His vision stresses "connections" but these connections are primarily connections within the walls of Harvard University. He mentions opportunities for the School to connect with Harvard's Faculty of Arts and Sciences, Harvard Business School, Harvard's Kennedy School of Government, Harvard Law School, and Harvard's School of Education. But connections with the local health clinic and the local elementary school are not mentioned. When Dean Bloom mentions the exciting opportunity to teach Harvard undergraduates "to think about problems of public health nationally and globally", maybe he also wanted to mention "locally". Because where else could it be easier for Harvard students and faculty to put their knowledge into practice than right in their own backyard? Improving the health of people in Allston may be less glamorous than establishing a China Initiative, but maybe it is possible for Harvard to do both. When Harvard's employees wax eloquently about "partnerships" with Allston, most people in Allston think that means more than just writing checks for new sidewalks and Little League uniforms. Committing to apply the mental resources of Harvard to solve local problems and build a better community is what a real partner would do.